1. The World Water Forum is illegitimate: It is a corporate trade fair aimed at promoting market access to multinational water corporations in the water and sanitation sector. It gives corporations privileged access to decision-makers behind closed doors and should not be used as a space to advance policies to solve the global water crisis. Public water policies must be discussed democratically in consultation with the public and with impacted communities in particular. 2. Water and sanitation are a human right: The greedy and profit seeking practices of multinational water corporations threaten the universal human right to water and sanitation: the privatisation of water in various forms has led to blatant violations of this right through tariff hikes, water quality degradation, inefficiency, corruption and destruction of the environment. The human right to water is also violated through the destruction of watersheds and commodification of water resources in the form of large dams and infrastructure, water diversions, extractive industries, hydraulic fracturing and other dirty industries. 3. Water is part of the commons: Water supply and sewerage must publicly owned and managed in recognition of water as a vital part of the commons. We will continue to work together to stop privatisation and to remunicipalise private water and sanitation systems. We call on the public sector – local and state governments – to improve the social and ecological management of water quality and water resources and to solve dispute between locals where necessary. Public and community management must be strengthened by ensuring transparency, accountability, access to information and public participation in decision-making. 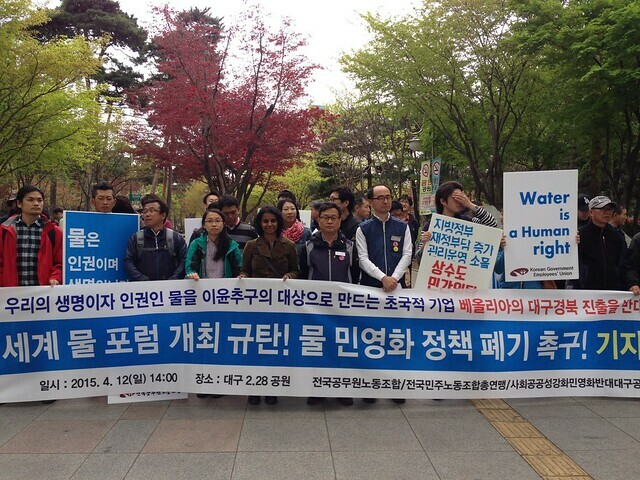 We urge the Korean government to promote policies that strengthen public water and sanitation services and demand an end to all negotiations with the French multinational corporation, Veolia. 4. We call for the Post 2015 Development agenda to recognize water and sanitation as human rights and as part of the commons. Unless the Post 2015 Development Agenda is rooted in a human rights framework and a commons-based perspective, it will run the risk of facilitating the commodification of water resources and privatization of services. 5. We will continue to support each other’s struggles as a global water justice movement. We will strengthen our ties of solidarity in our struggles to stop privatisation and promote quality public water and sanitation services at the community level, the national level and the global level. From Daegu Gyoungbuk, Korea we connect with struggles and victories against privatization around the world.